Schoc Chocolates has been a long time in the making, starting back in 1998 when co-founder and owner Murray Langham (pictured) published his book Chocolate Therapy – Dare to Discover Your Inner Centre. “That led me to making my own chocolates, in a tiny cottage in Greytown”, Murray says. “ Word spread, Schoc’s fame and our assortment options grew and now we’ve opened a Wellington store to cope with demand.” This demand has increased our corporate customers. Capital Schoc, in Waring Taylor St, not only sells chocolate, there’s a unique library wall of chocolate - la bibliothèque du chocolat - with more than 80 different chocolate tablets on display, and a huge array of things to buy. 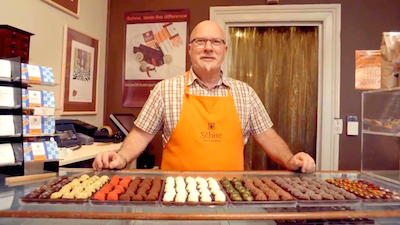 Schoc Chocolates was one of 85 international Chocolatiers featured in the book “Chocolate Unwrapped”, released in 2011. Original generation time 3.9006 seconds. Cache Loaded in: 0.0193 seconds.